We wouldn’t want our boards washing away from us. Our black coiled ring surfboard leash is designed with style and quality for better surfing performance. 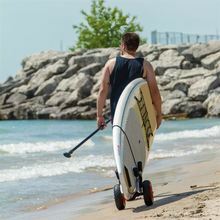 Our black coiled surfboard leash has double swivel feature to avoid it locking unto your leg disturbing your water activity. The black colored rope will compliment any surfboard design and color because of the minimalist feature of the color black.